There are not many authors out there where I’ve read every book they’ve written, but Sophie Kinsella is one of them. (This is actually only partially true – I’ve read every book she’s written under Sophie Kinsella, but I haven’t read any of the seven books she’s written under her real name, Madeleine Wickham). Basically, when a Sophie Kinsella novel comes out, there is zero chance I’m not going to read it. This one showed up on my radar as I was preparing the list for the 2019 Everyday Reading Book Club and I added it as March’s book since I like having a chick-lit book in that spring break season. 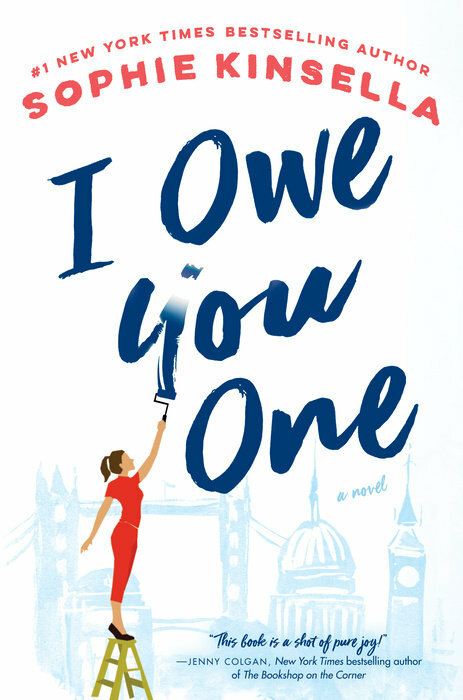 I did so with the caveat that I hadn’t yet read I Owe You One (it just came out today) and if it was terrible, I’d swap it out for my all-time favorite of her books, I’ve Got Your Number, which I’ve been dying to read again. So here’s the deal. It wasn’t terrible, but I’m still switching it out for I’ve Got Your Number because I Owe You One just didn’t delight me. Here’s the basic premise – Fixie is kind of obsessed with fixing things (hence her nickname) and if something is crooked or misplaced or someone is having trouble, she almost cannot stop herself from doing everything to fix it. She helps run the family store, Farr’s, a kind of general merchandise sort of store in London, alongside her mother. Her dad died nearly ten years earlier and the store was his baby. She has two siblings who sort of help but are mostly involved in their own lives. She’s also been pining for Ryan, the golden boy of her high school and her brother’s best friend, for years and years. He now lives in LA as a movie producer, but she’s holding onto some hope that maybe they have a future together (they spent about ten days together a year earlier, but he’s made no contact since). In the midst of all this, she stops at a coffee shop and, while drinking her beverage, the businessman at the next table steps out to take a call and asks her to watch his laptop for a moment for him. While he’s gone, a piece of the ceiling of the coffee shop collapses and she throws herself onto his laptop to protect it. When he returns, the other customers hasten to tell him all about Fixie’s heroic save and when she won’t accept a drink, he writes on a coffee sleeve “I owe you one. Redeemable in perpetuity” and gives it to her with his business card. She has no intent to call in that favor, of course, but when Ryan arrives back in London with his career in pieces, her brother and Ryan convince her that the only thing to do is ask Seb (the aforementioned businessman) for a job for Ryan since obviously he owes her one. And then she does Seb another favor and he does her one and on and on, while she tries to manage a relationship with Ryan, keep the family shop going, deal with her difficult siblings, and, you know, figure out what she wants in her own life. I didn’t hate it, but it didn’t have the SPARKLE I expect from most of Sophie Kinsella’s book. There were only a couple of semi-funny parts, as opposed to some of her other books which I can’t even read in public because they are so hilarious. It also felt a bit more racy than some of her other books, which I wasn’t wild about. And overall, the book just felt a little messy with too many things going on. It wasn’t hard to keep track of everything – more like it just felt like there were so many things JAMMED into the book. There are both of her siblings with their own backstories and current issues. There is her own failed catering business that she still feels the sting of. There’s Seb’s girlfriend and his own sad personal history. There’s Fixie’s best friend Hannah and her husband who are hoping to have a baby. There is her history as a competitive ice skater, plus her obsession with fixing things, how inferior she feels compared to her siblings, and her strong adherence to the family mottos her dad came up with. Basically, I Owe You One was a pleasant enough airplane read for my trip to Seattle, but it just wasn’t a book I wanted to recommend across the board or spend a month chatting about. If you read this one, I’d love to hear what you think about it (and also what your favorite Sophie Kinsella book is!). I just checked out my first ever Sophie Kinsella book (I’ve Got Your Number) yesterday, on your recommendation. I’m not always into chick lit, but I needed a light and fun read and I’m hoping this will be it! Thanks for the review! You have made me a Sophie Kinsella fan! I just finished I’ve Got Your Number and really liked that book. A little mystery and romance and just a fun read! Huge Sophie Kinsella fan here too! I’ve read most of her Madeline Wickham books as well, but for me, nothing will ever top Shopaholic. I just love Rebecca Bloomwood so much! “I’ve Got Your Number”!!! I have listened to that book 3x and the beginning makes me laugh out loud every time. “Can You Keep a Secret” is another favorite that I’ve listened to more than once. I’ve been waiting for her to write something else that I enjoy as much and I’m still hoping (perhaps with a good reader for the audio version) that this one is it.